The barChart (and bigBarChart) track format displays a graph of category-specific values over genomic regions, similar to the GTEx Gene track. This format is useful for displaying gene expression and other datasets where it is desirable to compare a set of variables over genomic regions. While a barChart track can effectively show datasets with single values for each variable (e.g. comparing individual samples), the format provides specific features to display studies comprised of a large set of samples for each variable (e.g. comparing tissues with multiple samples for each tissue). 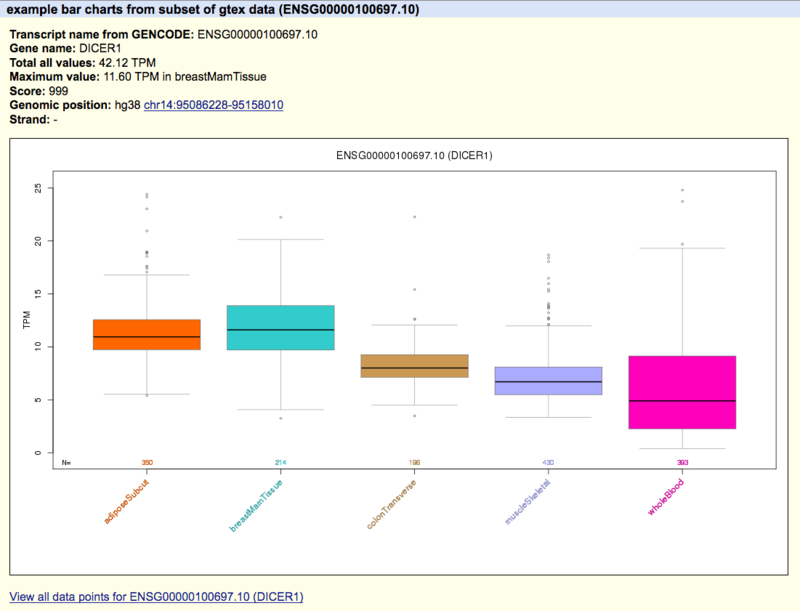 In this usage, the main genome browser display presents a graph of summary values (e.g. medians) for each variable, and the distribution of sample values across variables is shown via a boxplot graph shown on the details page for each region. The barChart format is available as a standalone plain text bed6+ format for use with smaller datasets as a custom track, and as a binary indexed format (bigBarChart) suitable for track hubs and custom tracks. The bigBarChart format provides more track customization features (i.e. schema customization, and label configuration support), and is recommended for users who can use command-line tools and have web-accessible data storage. If you do not have web-accessible data storage, please see the Hosting section of the Track Hub Help documentation. barChart format files are converted to bigBarChart files using the program bedToBigBed, run with the -as option to pull in a special autoSql (.as) schema file defining the fields of the bigBarChart. The following autoSql definition illustrates the basic schema supporting barChart (and bigBarChart) tracks. string chrom;               "Reference sequence chromosome or scaffold"
uint chromStart;            "Start position in chromosome"
uint chromEnd;              "End position in chromosome"
string name;                "Name or ID of item"
char strand;             "'+','-' or '.'. Indicates whether the query aligns to the + or - strand on the reference"
string name2;               "Alternate name of item"
uint expCount;              "Number of bar graphs in display, must be <= 100"
float[expCount] expScores;  "Comma separated list of category values." bigint _dataOffset;         "Offset of sample data in data matrix file, for boxplot on details page, optional only for barChart format"
int _dataLen;               "Length of sample data row in data matrix file, optional only for barChart format"
The first 6 fields of the barChart format are the same as the first 6 fields of the standard BED format. The name2 field provides an alternate item name, useful if you would like to associate multiple transcripts to a single gene locus, different variables to the same experiment type, etc. The expCount and expScores fields are used as in the Microarray format; they define the number of categories and a value for each category (see example #1 below). The _dataOffset and _dataLen fields are used internally by the track to locate sample values for a region in an optional matrix file containing all sample values. These values are used to draw a boxplot of all sample data on the details page for the bar chart. When a matrix file is not supplied, these fields should be set to 0. (As a convenience, these fields are optional for barChart custom tracks). uint score;                 "Score (0-1000), derived from total expScores (below)"
char strand;             "+, -, or ., indicating orientation of the item"
uint expCount;              "Number of tissues"
float[expCount] expScores;  "Comma separated list of median expression in RPKM for each tissue." bigint _dataOffset;         "Offset of sample data in data matrix file"
int _dataLen;               "Length of sample data row in data matrix file"
Customing this file will make your data more easily interpreted by users, who will see the field descriptions when accessing the track data from the Table Browser, when viewing items on the Genome Browser details pages (via the "view table schema" link), and (for users who download files), from the -as option of the bigBedInfo tool. The steps for creating barChart tracks differ from the process for creating bigBarChart tracks. The steps also differ based on whether you have an input matrix file (generated perhaps from an RNA-Seq differential expression analysis pipeline) or not. If you have an expression matrix-like file, skip to Example #3, otherwise follow example 1 below. In this example, you will create a barChart custom track using example bed6+3 data. Paste the following track line into the custom track management page for the human assembly hg38. After the file loads in the Genome Browser, you should see an automatically colored bar graph with 5 bars. Hovering the mouse over any of the individual bars will display the name of the particular bar ("wholeBlood", "adiposeSubcut", ...) as well as the value associated with that bar (10.94, 0.74, ...). The order of bar names in the barChartBars field of track line should exactly match the order of the values in the expScores field. In this example, you will create a bigBarChart track out of an existing bigBarChart format file, located on the UCSC Genome Browser http server. This file contains data for the hg38 assembly. After the file loads in the Genome Browser, you should see an automatically colored bar graph with 5 bars. The same rules apply to bigBarChart custom tracks as barChart custom tracks in that the order of names in the barChartBars field should exactly match the order of values from the expScores field in the bigBarChart file. In this example, you will use the helper scripts expMatrixToBarchartBed and bedJoinTabOffset on example matrix and category files in order to generate a bed6+5 barChart format file, which can be loaded as a custom track into the Genome Browser. The matrix file is a tab-separated (must be tabs, not spaces) file of the following form, perhaps resulting from an RNA-Seq analysis pipeline. Please note that the first line must describe each column like in the example snippet below. Each column in the first line of the matrix file must be found in the categories file. We have provided an example category file and matrix file to follow along with the rest of this example. will be one of three input files to the helper script expMatrixToBarchartBed. For an example file to follow along with the rest of this example, you can download an example bed6+1 file here. Download the helper programs expMatrixToBarchartBed and bedJoinTabOffset from the utilities directory appropriate for your operating system. Use the upload button on the custom track management page for the human assembly hg38 to upload the file just created. expMatrixToBarchartBed automatically computes the median values for all the samples in the matrix file, which is useful when your experiment contains data from 8000 samples (like the GTEx data). Furthermore, expMatrixToBarchartBed can compute the mean value of all samples in a category of the matrix file (instead of the default median), in addition to allowing for a specific ordering of the expScores field. NOTE: Set the barChartMetric setting to 'mean' if you use this option of expMatrixToBarchartBed. For more information about expMatrixToBarchartBed or bedJoinTabOffset, run the program with no arguments to get a usage message. In this example, you will use the bed6+5 file created in Example 3 to create a bigBarChart file, allowing the data to be remotely accessed and exist within a track hub. The track settings for bigBarChart on a hub can be viewed here. Use fetchChromSizes to create a chrom.sizes file for the UCSC database you are working with (hg38 for these examples). Alternatively, you can download the chrom.sizes file for any assembly hosted at UCSC from our downloads page (click on "Full data set" for any assembly). For example, the hg38.chrom.sizes file for the hg38 database is located at http://hgdownload.soe.ucsc.edu/goldenPath/hg38/bigZips/hg38.chrom.sizes. Save the autoSql file barChartBed.as to your computer. Move the newly constructed bigBarChart file to a web accessible http, https, or ftp location. track type=bigBarChart name="bigBarChart Example One" description="A bigBarChart file"
barChartBars="adiposeSubcut breastMamTissue colonTransverse muscleSkeletal wholeBlood"
Please note, the fields in your barChartBars line must match the terms in your categories file (exampleBarChartSamples.txt) in order for the boxplot display to show up on the details page for tracks. Below is an example image indicating the benefit of using these files in a hub, note the "View all data points for..." link that allows extracting data from the matrix file (exampleBarChartMatrix.txt) specific for this named item. If you would like to share your barChart/bigBarChart data track with a colleague, learn how to create a URL by looking at Example 11 on this page. Because bigBarChart files are an extension of bigBed files, which are indexed binary files, it can be difficult to extract data from them. UCSC has developed the following programs to assist in working with bigBed formats, available from the binary utilities directory.